While Jack Frost nips at your nose, you can take the edge off with a little ‘nip’ of your own! IWA offers an extensive selection of classic and beautifying bar essentials and accessories, most of which can be personalized: see catalog for pricing and options. Order by date guarantees delivery by December 24. Eisch Circo Decanter – Who needs five golden rings when you’ve got the mother of all Rings? 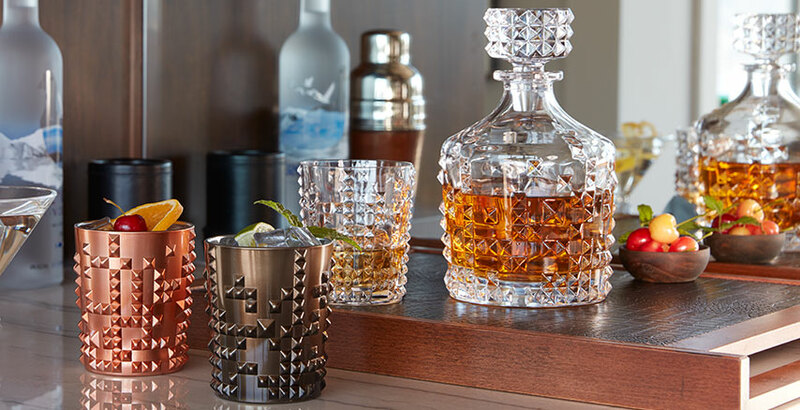 Serve guests from a true work of art made of mouth-blown, lead-free crystal. Includes crystal stopper. Nachtmann Punk Decanter Set – Thank Central Saint Martin’s Art & Design college in London for these textured asymmetrical patterns bursting with attitude. (Includes matching stopper and 2 tumblers, mouth-blown in Europe from lead-free crystal.) Tumblers also available separately in sets of 2: orange or black crystal. 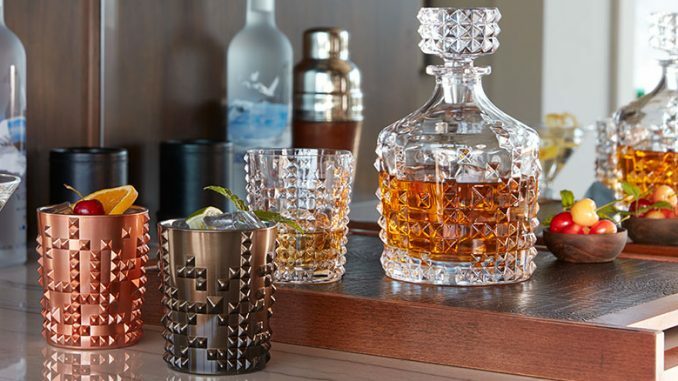 Tall Orsay Decanter – A classic cylindrical shape made of mouth-blown, lead-free glass from Europe highlights the pure clarity of premium distilled spirits. (Available in 2 sizes, includes fitted glass stopper.) Personalized Orsay Decanter: order by 12/11. Don’t forget non-purists who appreciate a little fruit or spice with their sumpin’-sumpin’! Literally mix it up in the Schott Zwiesel Tritan Pure Punch Bowl Set. Made in Germany of Titanium-based lead-free crystal, it’s highly resistant to breakage, chipping, and clouding: as clear and beautiful as it is resilient. Set includes dishwasher-safe bowl, 6 tumblers, and ladle. Of course, no holiday gathering is complete without the old standby. 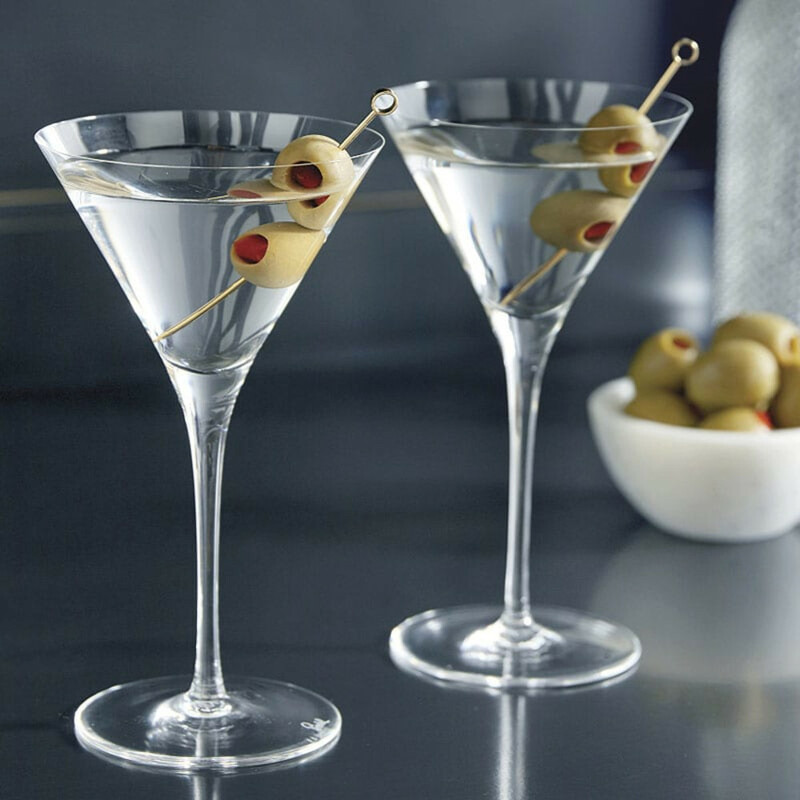 Elevate yours to hoity-toity with the Riedel Sommeliers Martini Glass made of mouth-blown, lead-free crystal which features a thinner rim to showcase each tasty sip… Or forego the classic shape and funk it up with the fantastic Nachtmann Punk Martini Glasses for some rip-roaring holiday rebellion instead! Fans of single malts and aged whisky blends will recognize the celebrated shape of dishwasher-safe, lead-free crystal Glencairn Whisky Glasses or the premium feel of Riedel O Whisky Glasses made of lead-free glass. Intimate gatherings are one thing, but if your crowd leans raucous and rowdy, then you’ll require more practical options. Try the Govino Shatterproof Glasses – sure, everyone knows they’re great for wine, but did you know they have whisky options too? BPA-free PETG: abuse, re-use, eventually recycle. Personalized Govino Glasses: order by 12/11. For starters, every bar needs a comprehensive Bartender’s Bible mixing guide. Then ditch the mismatched, hand-me-down tools for our gorgeous Prohibition-inspired Crafthouse Bar Tool Set. Designed by world-renowned mixologist Charles Joly in collaboration with Fortessa, these barware tools are built for professionals and include a stainless steel jigger, hawthorne strainer with Boston shaker, and solid walnut muddler. Kick it up another notch by adding three leather bar tools you’ll want to unwrap: a stainless steel Cocktail Shaker, double-walled champagne-friendly Wine Chiller, and stainless steel Hip Flask, all enrobed in gorgeous, genuine leather. Why stop there? 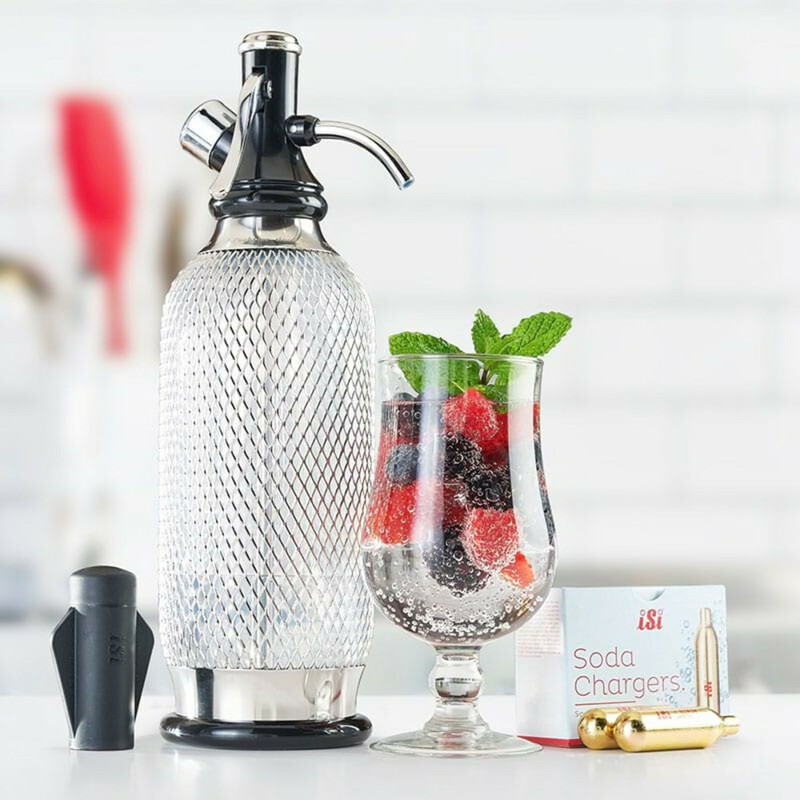 Create fizzy handcrafted cocktails and spritzers using the retro-cool Classic Sodamaker Kit made from unbreakable BPA-free acrylic and stainless steel mesh. Hands-off: Personalized Oak Barrels gracefully age wine and whisky. Experiment with 3 flavor essences: Kentucky Bourbon, Tennessee Whisky, and Highland Malt Scotch. Order by 12/10. Hands-on: Charles Joly, (mixologist and superfan of rich, peaty spirits,) is at it again with last year’s best-selling Crafthouse Smoking Box. 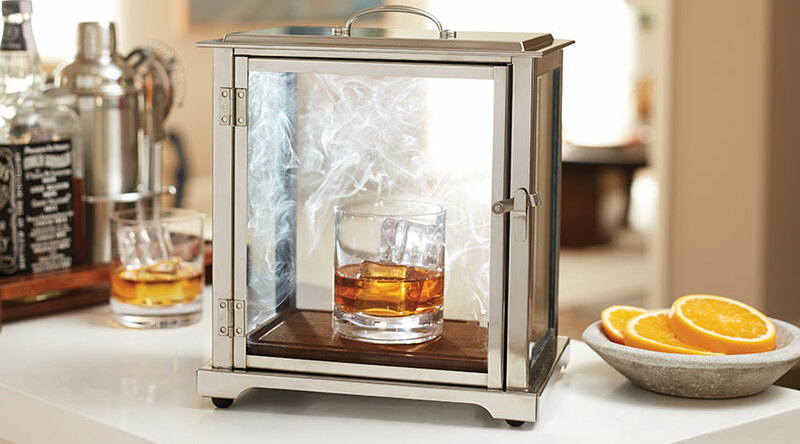 Try your own hand at smoking ice, glasses, individual ingredients—even entire cocktails! The appealing and intriguing box includes a smoking gun with both Hickory and Apple wood for maximum experimentation. Save Frosty! Don’t forget to throw in a few cost-effective boxes of freezable Whisky Stones to chill all those fancy drinks without diluting them! Handcrafted in small batches, our all-natural McReas Tasting Caramels are specially designed to pair with whisky, wine or spirits. Three gift tubes contain 18-20 pieces of each flavor: Deep Chocolate, Classic Vanilla, and Single Malt Scotch. About the Author: Lori Stevens is a former wine magazine food editor who has worked in multiple wineries and traveled throughout many of the world’s wine-producing regions. She currently lives in Seattle. Bottoms up!